Line a baking sheet with parchment paper and butter the paper. In a medium saucepan, combine the sugar, corn syrup and water and bring to a boil over moderately high heat, stirring just until the sugar dissolves. 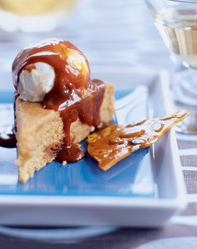 Continue to cook, undisturbed, until a deep amber caramel forms, 8 to 9 minutes. Remove from the heat. Add the pumpkin seeds and the dissolved baking soda and stir until combined, then quickly pour the mixture onto the baking sheet, spreading it into a thin layer with a spatula. Let cool until hardened. Break into shards and serve. 1. Make an ice bath by putting some ice and a little water in a large bowl and nest a smaller metal bowl (one that will hold at least 2 quarts, 2l) inside it. Set a mesh strainer over the top. 2. In a medium saucepan mix the milk, cream, granulated sugar, ginger, ground cinnamon, cinnamon stick, nutmeg, and salt. 3. Warm the mixture until hot and the edges begin to bubble and foam. 4. Whisk the egg yolks in a separate bowl and gradually whisk in about half of the warm spiced milk mixture, stirring constantly. 6. Immediately pour the mixture through the strainer into the bowl nested in the ice bath. Mix in the brown sugar, then stir until cool, then chill thoroughly, preferably overnight. 7. Whisk in the vanilla, liquor (if using), and pumpkin puree. Press the mixture through a fine-mesh strainer, then freeze in your ice cream maker according to the manufacturer’s instructions. Variations: Stir in 1 to 1 1/2 cups (250 – 320 g) white or milk chocolate chips, crushed caramel, chopped up Skor or Daim (toffee) bars, or chopped toasted pecans or walnuts. A bit of chopped candied ginger would be nice, too. Leftover bits of crumbled gingersnaps or gingerbread, or even toasted bits of brown bread or gingerbread could also be folded in, or crumbled on top for serving, which was suggested in the book. Rub the dry ingredients together like making crumble. Add the egg and mix in till it all sticks together. Beat the egg yolks with the sugar till thick and creamy. Add the Quark and beat in well, mix in the sultanas, potato flour and baking powder. Then at last fold in the egg whites. roll out the pastry thinly best is between cling foil line a 28cm spring form making sure the the lining comes 2/3ds of the way up at the sides. Prepare two +- 20 to 23 cm layer cake pans by buttering the interiors and lining the bottom with baking paper. I had batter left over with 20 cm pans. Cream butter together with sugar. Beat in eggs, orange rind and vanilla. Add to creamed mixture alternately with milk/juice mixture. Pour into greased & papered pan. Tap pans on table to release any air bubbles before placing in oven. Bake for 25-35 minutes or until cake springs back when lightly touched in center and a toothpick emerges clean. Time depends on your oven. Grease two cooling racks (very necessary) and after 10 minutes, loosen the edges with a knife and turn out onto the rack. Cool completely. Beat the butter until creamy and gradually beat in the sugar, then the salt. Beat in the orange juice and then beat hard until it is creamy, smooth and fluffy. Stir in the rest of the ingredients. Ice the cake patiently, scooping on a glop at a timer, then spreading with a wet table knife. Stop and re-wet every time the icing starts to lift. You may want to cut a few very thin slices of orange and cure them in sugar for a few hours, but if you know a few days in advance, it would be even nicer to candy some orange peel for decoration. Just make it and dry it, then cut into threadlike strands for décor. This is a cake so moist you could call it wet, so the surface is very tender. Handle only when cold and leave the paper on the bottom until assembling it. When icing it, really do spread only with a wet knife. If your kitchen is cold you may have to do as I do and put the bowl in which you are working the butter into a bowl holding warm tap water until the butter starts to soften. Remove it quickly so it doesn’t melt, however. In a large mixing bowl sift in the dry ingredients and make a well in the centre. Gradually add the melted butter mixture and fold together. Pour in the beaten eggs and milk and combine together. Mixture will be quite runny but don’t worry. Pour into your baking tin. 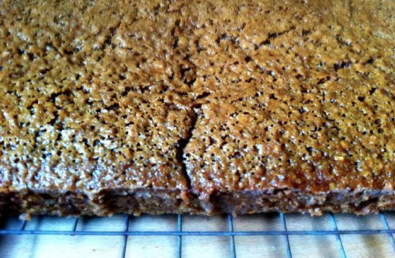 Bake for 1 hour, however keep an eye on it as parkin can easily become dry and over baked. Adapted from a BBC Food recipe. 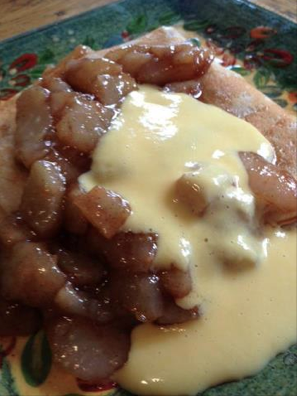 Amber’s Ginger Pear Compote with Bourbon Creme Anglaise over Crepes. Melt butter in pan, add sugar until melted. Add pears and ginger, cinnamon and splash of bourbon and cook for about 5 minutes or to desired tenderness. Set aside. Beat eggs, sugar and salt until the color lightens. Set aside. Heat milk until scalding. Slowly add a tablespoon of milk to egg mixture, whisking the whole time. As you get further along you can stream milk in, but don’t stop whisking. Add Bourbon. Return mixture to heat and bring the heat up slowly over a low flame. Once the cream thickens, it’s done. Turn off heat, but keep mixing until it cools. Make crepes according to basic crepe recipe and compose dish!!! Reduce the poaching liquid over medium heat until about 1 cup remains. It should be a deep ruby red. Remove the spices and set aside to cool slightly. Meanwhile, spread the apricot jam on the tart shell in a very thin layer, just enough to seal the crust. 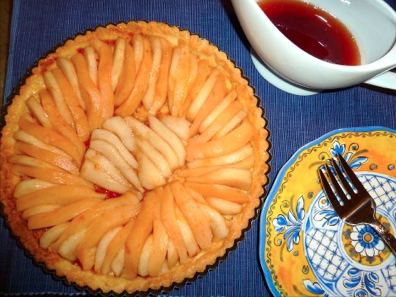 Arrange the pear and quince in a pleasing alternating pattern in the center of the tart. Brush the fruit lightly with the reduced poaching liquid. Serve with remaining poaching liquid. 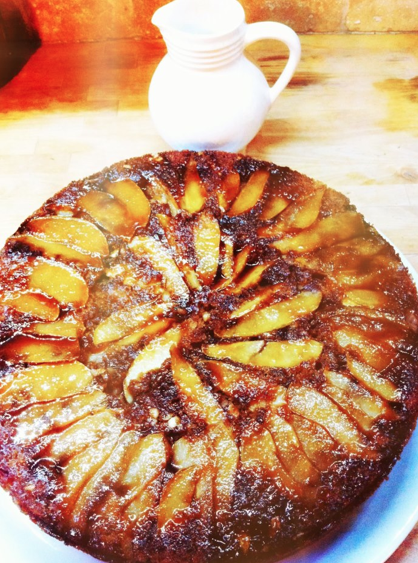 Delicious pear, ginger and walnut upside-down pudding, a lovely moist pud and one of our customers favourites when we had our pub! 8. 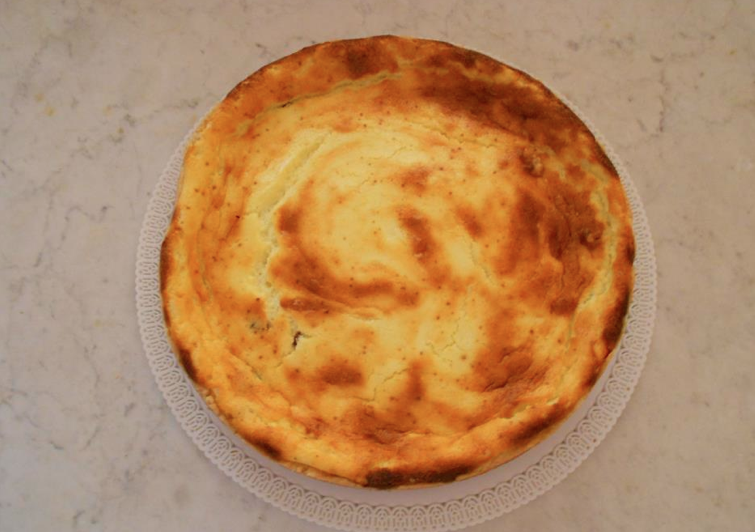 Turn out upside-down onto a large plate and serve warm with cream, ice cream or custard – yummy! Place first four (dry) ingredients in a medium-sized saucepan, along with 1/2 cup of the milk and whisk to combine into a thick paste. Add the remaining milk, bring the mixture to a boil, and whisk to combine well. When sauce boils, reduce heat to low and simmer very gently for 5 minutes, whisking often. Remove from heat, add vanilla, and cool. Finely chop the nuts in the work bowl of a small food processor. Crumble the cheese into the bowl and add the cream and salt and pepper to taste, and process until completely smooth, scraping sides when necessary. Serve at room temperature. Combine pears, pear nectar and lemon juice in heavy medium saucepan. Bring to boil over medium-high heat. Transfer to processor; puree until smooth. Chill until cold. Whisk yolks and sugar in medium bowl to blend. Bring 1 cup cream to simmer in heavy medium saucepan. Gradually whisk hot cream into yolk mixture. Return to same saucepan. Scrape seeds from vanilla bean into mixture; add bean. Stir over low heat until custard thickens and leaves path on back of spoon when finger is drawn across, about 7 minutes (do not boil). Pour through strainer into bowl. Mix in 1 cup cream. Cool 15 minutes. Add corn syrup and 3 cups pear puree to custard and whisk until blended (reserve any remaining pear puree for another use). Chill custard until cold, at least 4 hour or overnight. 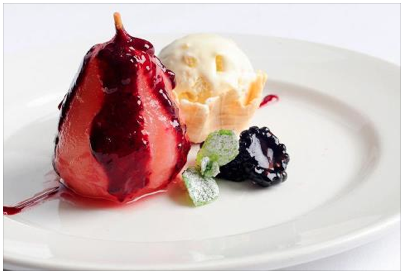 Except the pears and the ice cream, combine all other ingredients and bring to a boil. Reduce the heat to a simmer and carefully add the pears. Simmer for 10 – 12 minutes turning pears to coat on all sides and simmer an extra 10 minutes. Test the pears for tenderness by poking with a fork. Remove pears to a bowl and allow to cool. Turn up the heat and reduce the wine mixture by half to a syrupy content. 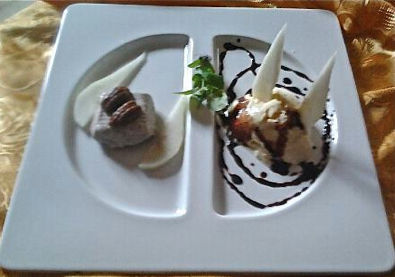 Place two halves on each plate for service. Pour over wine syrup and add a scoop of ice cream or gelato.